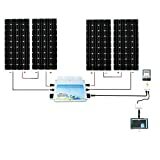 Perfect 24 volts grid tie solar panel kit. Ideal daily output: 3KWh (depending on the availability of sunlight). High-efficiency silicon solar cells ensure high performance of solar modules and create maximum power output. 25-year transferable power output warranty: 5-year/95% efficiency rate, 10-year/90% efficiency rate, 25-year/80% efficiency rate. 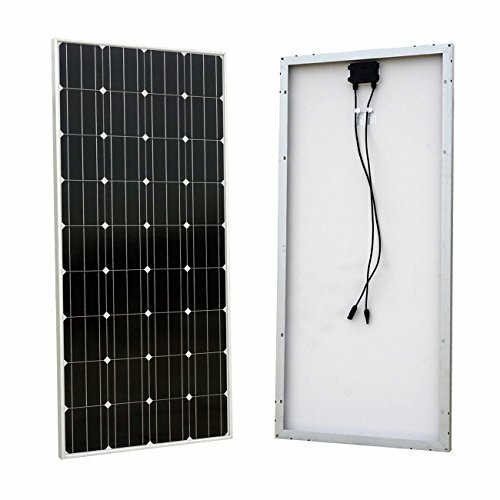 Easy to install with pre-drilled holes on the back of panels for fast mounting and securing. 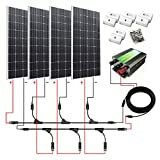 Each solar panel comes with 90cm 12awg cable with MC4 Male/Female quick connectors. By-pass diodes are pre-installed in waterproof IP-65 rated juncton box to minimize power drop caused by shade and ensure excellent performance in low-light environments. 600W MPPT Function Waterproof Grid-Tie Micro Power Inverter protects the system from overload, low voltage, over voltage, over current, reverse polarity: pure sine wave output, use SPWM directly to make pure sine wave output, high-frequency high conversion rate. Corrosion-resistant aluminum frame for extended outdoor use, allowing the panels to last for decades as well as withstand high winds (2400Pa) and snow loads (5400Pa). Lightweight anodized aluminum frame and reinforced safety and anti-reflection coated glass 3.2mm thick (tempered + patterned).